In this post, we do our best to prioritize cost alongside of functionality. After doing our research, we’ve taken the work out of your bike rack search by researching other “best bike rack” lists, reading reviews and pulling in some of our own personal favorite racks based on years of use. In short, we actually tested many different bike racks over the years. We’ve also selected SUV bike racks, trunk bike racks and hitch bike racks. 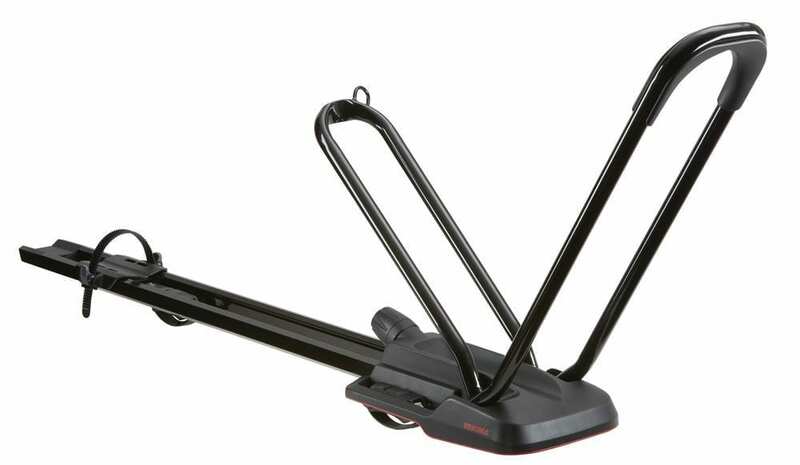 And for old-school bike transporters, we’ve included a roof bike rack option. If you’re looking for a Cargo Tray, check out the Malone Hitchking2 at REI. We’ve used the Malone for years. If you own a truck, you might want to consider using a truck bed bike rack, like the venerable Yakima Gatekeeper Truck Bike Tailgate Cover. If you’re still focused on purchasing a bike rack, read more about our favorite bike rack options below. While you can easily drop $400-$500 for a bike rack, our favorite bike racks are actually some of the lower cost options. Thankfully, these bicycle transporters work well with both our road bikes and mountain bikes. Recently, we’ve tested some of these racks as we transported road and mountain bicycles from one side of the US to the other–and all over the Northeast. 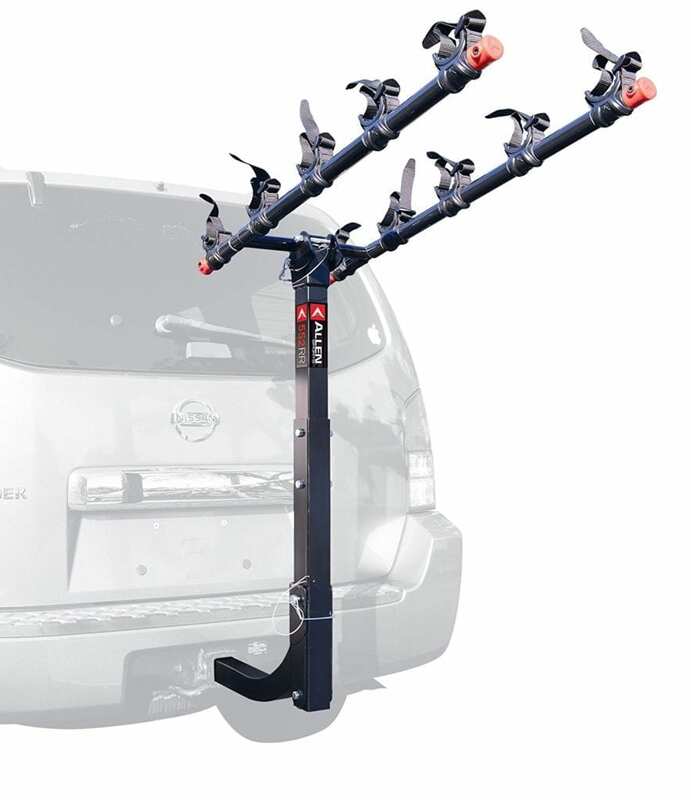 We were even rear-ended by another car that mangled all four of our bikes, destroyed the back panel of our vehicle, but couldn’t inflict any damage to our top choice on this bike rack list, the Allen Sports Hitch-Mounted bike rack. Also, regardless of whether you purchase a roof-, trunk- or hitch-mounted rack, make sure your rack fits your specific vehicle. 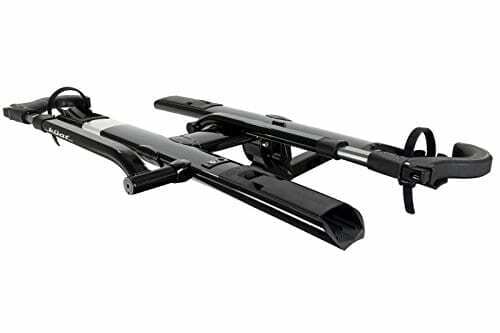 In the case of a hitch-mounted bike rack, you will need to check to see if you have a 1.25″ or 2″ receiver on your hitch. If you haven’t installed your hitch yet, go with the 2″ receiver. And if you live in an area where the roads are salted, don’t forget to cover your hitch with an inexpensive trailer hitch cover like this one from Amazon. You won’t find this on the top of anyone’s top 10 list, but the Allen Sports bike rack is by far our favorite bike rack. Go with the Allen Sports 5 bike option if you’ll be transporting 3 or more bikes–if only to have some more room. If you’re willing to spend a few more dollars, Amazon sells the 5 bike option with a built in lock to ensure thieves can’t remove your bike rack from the hitch. The rack clamps rotate and flex to accommodate bicycle frames of almost any size and shape. This is definitely the best feature of this bike rack; especially since other racks will rarely accommodate larger frames or will require special adapters that are not included with the rack. We’ve typically used the 5-bike rack for 4 adult bikes on the outside and 1 small child-sized bicycle secured using the straps closest to your vehicle. This rack will hold your bikes securely without wheels, handlebars or frames jostling from side to side. 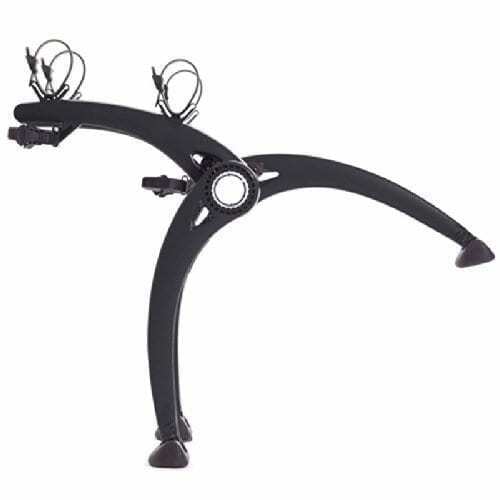 Overall, this bike rack is a bargain and in many respects outperforms most of the costlier alternatives. And, if for some reason you choose to forego on the integrated lock and instead purchase a hitch lock–just make sure you don’t ever lose the key! 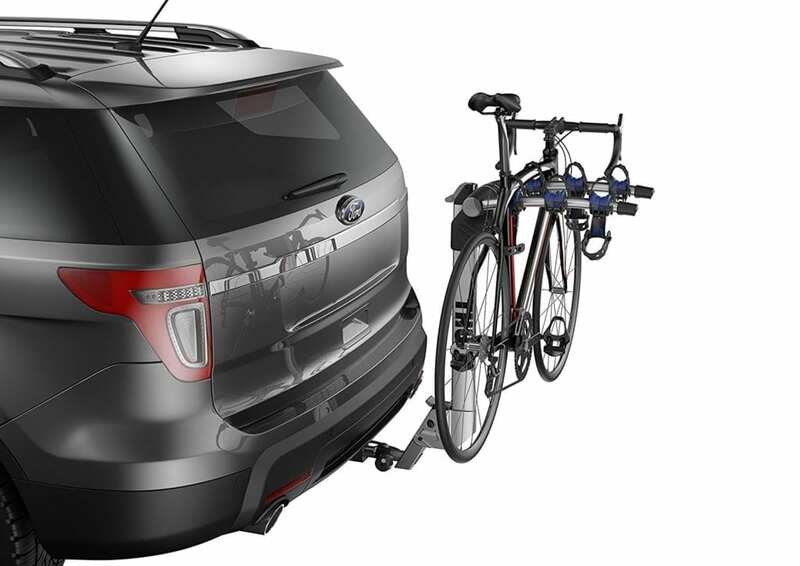 The Allen Sports Trunk-Mounted bike rack is a good option if you don’t have a hitch. If at all possible, just spend the money to purchase a hitch so you don’t have to mess around with the hassle of trunk mounted racks. You can find some solid trailer hitches for your vehicle online or call your local U-Haul store and make an appointment to have one installed. You can find the Yakima Ridgeback for almost $300 at Amazon. I’ve owned one of these bike racks for several years and used it on cross-country trips. I would not recommend it for mountain bikes since the straps and clamps are not large enough to accommodate larger or unusual frame sizes. When this was one of our primary bike racks, I was impressed with the locking mechanism that secured the rack to the hitch and also found the rack’s ability to fold impressive. While it may not be the bike rack to beat all bike racks it is well-design albeit a bit heavy. REI typically has a sizeable inventory of Yakima products and sells the Yakima Ridgeback for a reasonable price. The Saris Bones can be purchased at REI. This is another rack I used for some time. The Saris Bones is really a “high-utility” option based on its durability and size. It’s also an Amazon Editor’s pick and can be purchased at Amazon in six different colors for under $160. It’s main strength is its lightweight design, which makes it easy to store and transport. The Saris Bones, not surprisingly, has made its way onto most “top” bike rack lists and is a solid contender for bike transport if you’re not driving really long distances. The Kuat Sherpa 2.0 bike rack can be purchased at REI. It also has more than 80 reviews at Amazon, almost all of which are five stars. 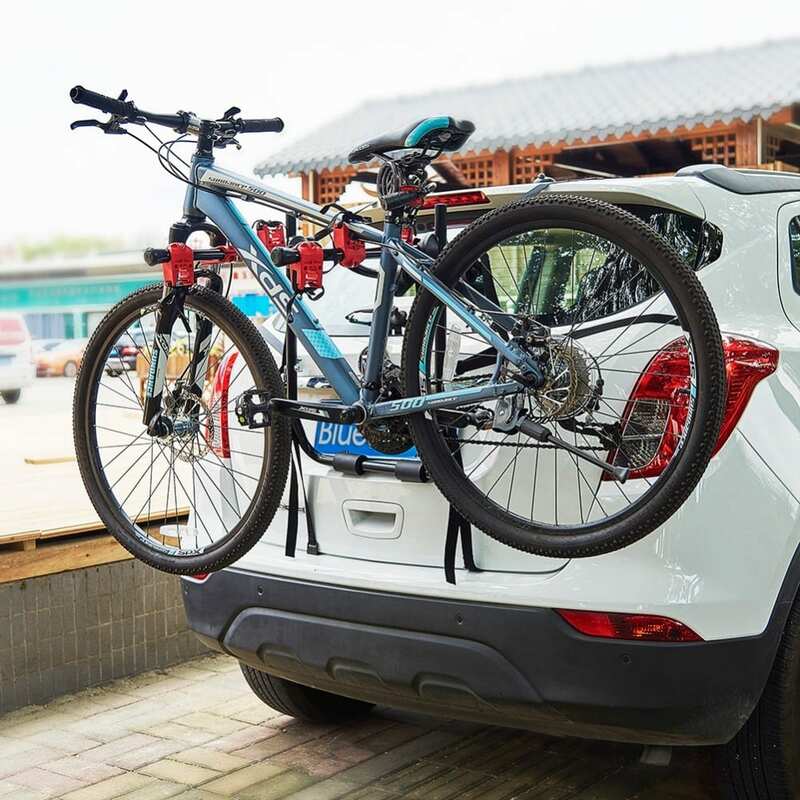 The Kuat Sherpa 2.0 bike rack is definitely the Cadillac of bicycle racks with a semi-integrated bike lock, front tire ratchet(s), rear tire cradles and an option to fold the rack when not in use. It also comes with a locking pin to secure the rack to your car. If you have one or more high-end full-suspension mountain bikes and you don’t want to risk knocking your disk brakes out of whack with a cheaper rack, this is a bullet proof option. In reviewing the Amazon reviews more carefully, several reviewers note this is as close to perfection as possible for road bikes based on its ability to fold away from the hatch door and its durability. The Helium Aero bike rack is larger and heavier than most trunk racks and doesn’t fold flat for storing, but it’s easy to install and store in some out-of-the-way location. If you’re going to use this bike rack with any larger frames, you might want to purchase one or two frame adaptor kits. 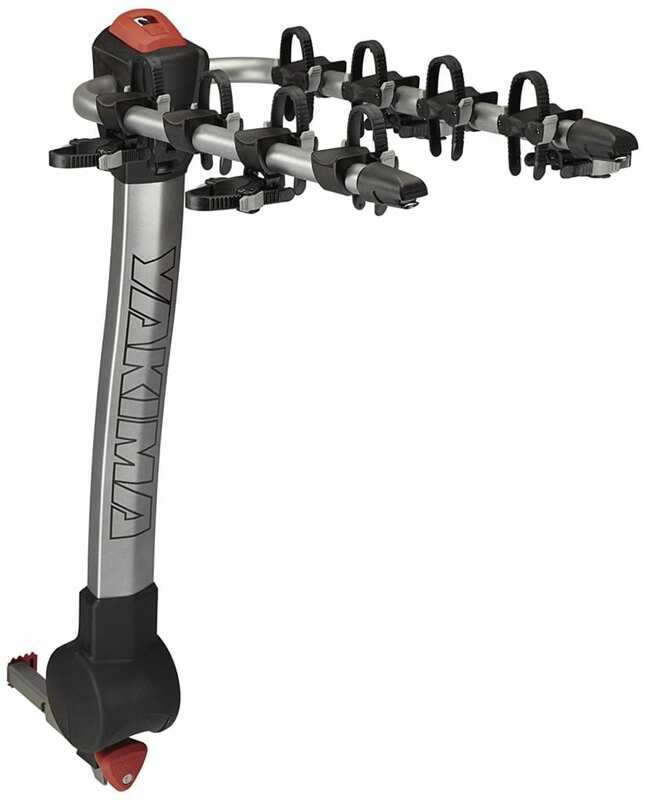 Another review of the Yakima HighRoad bike rack claims this rack is the easiest to mount on the vehicle and to load your bikes on. Because this bike rack holds your bike by the front wheel, it avoids coming in contact with the bike frame, which means you can keep your front wheel on your bike while transporting it. 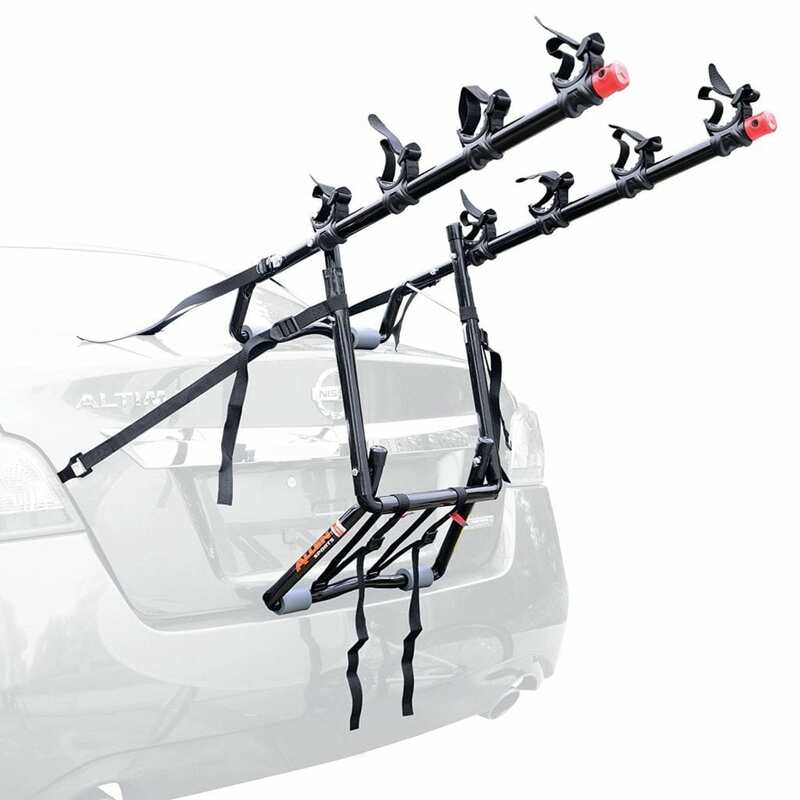 Although some front wheel racks aren’t the sturdiest, this rack performs well and includes a lock to secure your rack to the roof of your vehicle. This bike rack fits 26″-29″ wheels and tires from 23mm to 3.25″–in other words, it’s pretty darn flexible when it comes to different types of bikes. You Can Find A Cheap Bike Rack that Works! With our best bike racks listed here, we look forward to enhancements that are sure to come in the future. And, when all of your bikes are back in the garage, you may want to check out a wall mount bike rack to keep them off the ground and organized. Lastly, it you’re willing to spend a few more minutes to search for a deal, we recommend you visit REI. You can periodically find some really good deals on bike racks, locks, bike lights and other accessories in the REI Garage.